More than 200 people were killed in the Bali bombing in October 2002. JAKARTA, Indonesia (CNN) -- The U.S. Embassy in Jakarta, Indonesia, warned Thursday of an indication of an attack to Bali on New Year's Eve. The Embassy said the warning initially came from the Bali governor, Mangku Pastika, and that it passed on his alert verbatim. The governor, however, said there was no information about a new terrorist threat. "We never release(d) any warning related to terror on New Year's Eve," the governor's office said in a statement after the Embassy released the warning. "We however encourage both domestic and foreign tourists to be cautious," the governor's office said. "The terrorists hit Bali twice. Who knows what they will do next." Pastika's office said there was only a general alert on the island because of the holiday. 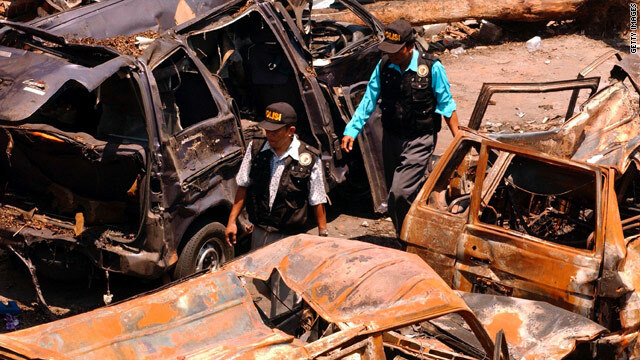 Terrorist groups, including Jemaah Islamiyah, have carried out repeated attacks in Bali and elsewhere in Indonesia since 2002. The Embassy did not elaborate on the governor's message, but the United States has a standing warning to U.S. citizens in Indonesia that extremists may target both official and private interests, including hotels, clubs, and shopping centers. "In their work and daily living activities, and while traveling, U.S. citizens should be vigilant and prudent at all times," the U.S. State Department warning states. "We urge U.S. citizens to monitor local news reports, vary their routes and times, and maintain a low profile. U.S. citizens must consider the security and safety preparedness of hotels, residences, restaurants, and entertainment or recreation venues that they frequent." Unknown attackers shot at foreigners in Banda Aceh, in northern Sumatra, last month, wounding a European development worker, the Embassy said. The attackers also targeted a house occupied by American teachers, but no U.S. citizens were hurt, it said. The most major recent attack was in July, when suspected Jemaah Islamiyah elements bombed two western hotels in Jakarta. The blasts at the JW Marriott and Ritz-Carlton hotels killed nine people -- including at least two presumed suicide bombers -- and wounded more than 50, including U.S. citizens. Also in July, armed assailants in Papua killed several people, including security personnel and one Australian national, the Embassy said. Jemaah Islamiyah, said to have links to Osama bin Laden's al Qaeda terrorist network, is blamed for the 2002 Bali bomb attacks in which 202 people, mainly foreign tourists, were killed. The bombing was blamed on Jemaah Islamiyah. The group was also said to be behind an attack on the Australian embassy in Jakarta in 2004 in which nine people died, and an attack on the same Marriott hotel that killed eight the same year. -- CNN's Atika Shubert in Bali and Andy Saputra in Jakarta contributed to this report.